Houston Audubon surveys the rookery weekly and posts the results on eBird. Visit Texas eBird to find out what's being reported. Smith Oaks Bird Sanctuary is an eBird Hotspot. The Rookery at Smith Oaks Sanctuary is open 365 days a year, dawn to dusk. The Winnie Street entrance is through a pedestrian turnstile gate. Visitors should use the pedestrian turnstile -- the trail swing gate which is next to the turnstile is only open for work vehicle access. The Winnie Street entrance does not allow for bus turnaround; buses or large vehicles will need to drive in and back out. The Old Mexico Road entrance is open February 15 – June 15 and weekends in the fall: September 15 - October 15. Parking is available year-round at the Winnie St. entrance and from February 15 to June 15 at the Old Mexico Rd. entrance. See the map page for parking locations. The U-shaped island in the middle of Claybottom Pond at Smith Oaks has become a favored roosting and nesting place for thousands of waterbirds. In the spring and summer herons, egrets, cormorants and spoonbills build their nests and raise their chicks on the predator-free island. Visitors to the sanctuary are able to get a good, close look at the home life of these beautiful birds throughout the breeding season. All year long the island is also used as a night roost by the same species of birds that nest here. They appreciate having a safe place to spend the night that is close to the marshes where they feed. The most spectacular time of day to visit the rookery is the last hour before dark when the birds are coming in for the night. 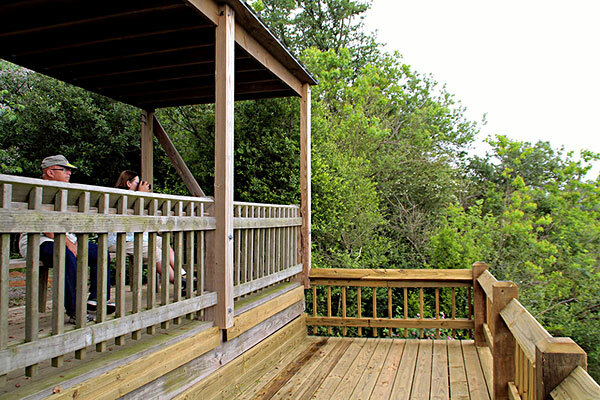 We have built several observation platforms to facilitate viewing the birds. During the spring season, we request photographers limit their time at the front of the platform to no more than twenty minutes so that everyone who would like to have good looks can be accommodated. The Rookery in Claybottom Pond in Smith Oaks was a big surprise. 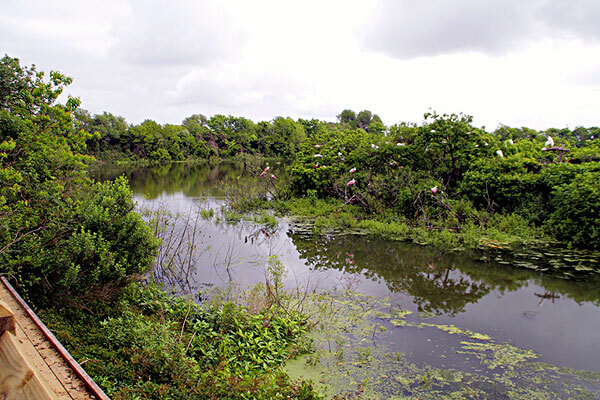 We didn't have the foggiest idea that it would happen when Claybottom Pond was included in the land Amoco generously donated to Houston Audubon in 1994. Claybottom is kind of a funky pond that was started in 1936 when dirt was needed for the railroad bridge over the newly dug Intercoastal Waterway. The pond was immediately used to enhance the community's water supply. It was enlarged to its present size in 1967 to supply water for the sulfur extraction facility northeast of the pond and to supply additional water to the High Island community. There is a large platform on the northeast side of the pond that once supported the big pumps that were needed to pump water out of the pond. To insure a there was always an adequate supply of water, water was pumped into the pond from the Neches River. If you go looking, you can still find the pipes in the levy on the northwest end of the pond. The island in the middle of the pond was the edge of the first pond, we don't know why it was left but it turned out to be a good deed for the birds. Colonial waterbirds like to nest in areas that are not accessible to mammalian predators so the island in Claybottom Pond is a perfect situation. The pond has a healthy alligator population and somehow raccoons and coyotes know they are there. When we first acquired the pond nothing was nesting there. This was probably due to the fact that birds, turtles and alligators in the pond were often used for target practice. Our "no hunting" policy resulted in quick changes and in July 1995, 50 heron nests were found on the island and birds were coming in to roost every night. 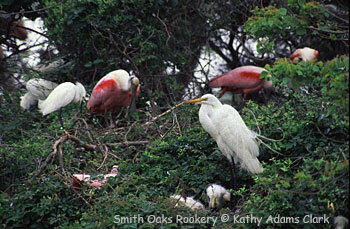 By 1997, 332 pairs of birds nested on the island and the first pair of Roseate Spoonbills showed up. The number of pairs of birds grew to 1083 in 2003, and now it is quite a show. Every year is different but in an average year, nesting activity starts in March when Great Egrets start spending the day on the island displaying their gorgeous plumes to try to attract a mate. Snowy and Cattle Egrets, Little Blues and Tricolored Herons, White Ibis, Neotropic Cormorants and Spoonbills soon show up and things get real active and noisy. Herons and egrets don't exactly make calls but they do make a lot of different noises and as you are watching nest building you will hear some strange ones. Snowy Egrets make a noise that sounds like gargling -I don't know what it means but you only hear it when they are courting. Neotropic Cormorants oink and some days it sounds just like a barnyard. They oink year round so they not only use the oinking for courting they seem to oink as a greeting in the evenings when they come in to roost. By mid April lots of things are happening, early eggs are hatching, and nest building and displaying are in full swing and you can get a close look at all the activity from the trail around the pond. There is no where else in Texas where you can get such a wonderful look at the home life of colonial waterbirds. When you visit the Rookery there are lots of the interesting things to watch for; like the stick hunt. With so many birds looking for sticks they are looking everywhere. Tricolors will hover over the pond and pick sticks up out of the water. Great Egrets will walk the trails. And everybody steals sticks from their neighbors when the neighbors aren't watching. Egg turning is another entertaining show. Eggs must be turned regularly to develop properly and some birds turn the eggs easily and quickly but for some it is a big production. Chick feeding, flight training and sibling rivalry are all fun to watch. Predation is also easy to watch but may not be enjoyed by all observers. There are always a few night-heron nests in the rookery and night-herons are predators. They regularly visit neighboring nests, grab unwatched chicks and take them back to their chicks. The other Rookery residents don't seem to pay much attention to the night-herons and aren't as protective as you would like them to be. The birds also aren't as careful around the alligators as you would like them to be. Since you can see the gators lying in the water next to the island you would suppose that the adult birds would see them also. But they wander right down to the shore for a drink and splash they are gone. So some of the show in the Rookery is not for those with a queasy stomach. The show at sunset is something not to miss. Year round thousands of birds spend the night on the island in Claybottom Pond. This show starts about an hour before sunset when the first birds trickle in, soon it is small flocks, then big flocks then they pour in from all directions. From 1996 - 1998 Peggy Boston and I regularly counted the number of birds coming in to roost and it was a challenging spectacle to record. The night we had the most birds was August 30, 1998 when we counted 13,069. The birds in the sunset light is quite a sight. As you can tell, any day is a good day to watch the show in the Rookery.